Hub, unlike the other programs in our suite, allows for the editing of previously created SD cards without the need to completely re-build them from scratch. In order to use the editing functionality, the SD card must have been previously created with Hub. If the card was not created with Hub, you will need to create a new show the first time. You can then start to use Hub's SD card editing features. Next, you will be asked to verify the correct drive for your SD card, as well as select the show you will be creating. Hub will attempt to correctly identify the drive, however you should always double check to ensure that you are using the correct location on your computer. Only shows that can be edited will be listed here. If a show is not listed here that is on your SD card, that show was created with either the Hardware Utility or the Simple Show Builder and does not have the required data to be edited. You will need to re-create that show as new. The sequences on your computer are shown on the right, the sequences in the order they play on the SD card is shown on the left. 1.The * in front of a sequence name on the SD card side means the sequence cannot be found in the folder on your computer where it was originally created from. You may have deleted the sequence on your computer. 2.For each sequence on the SD card, Hub will verify that sequence still exists in the same folder as it did when the SD card was created. The * in front of a sequence name on the SD card side means the sequence can not be found. If you move that sequence, even to a folder that is currently displayed on the right, hub will not be able to update the sequence when you write the SD card. You should always keep your sequences in the Light-O-Rama Sequences directory. 3.For any sequence with a * on the SD card side, if you remove that sequence from the SD it is lost. In order to re-create that sequence you MUST have the original sequence. You can still move the sequence in the show, or duplicate it on the SD card, but once removed it is gone. Before removing, you will be warned and asked if you really want to remove the sequence or not. 4.Once an SD card is created, there is no indicator on the card if it is for a Deluxe MP3 director, or a Mini Director. Even if you edit an SD card and turn ON scheduling, the Mini director will run the show whenever there is power. Mini Directors ALWAYS ignore a schedule. Here you will be able to add and change the order of sequences to be built for your show. If you have a Deluxe Show Director, you can also optionally schedule when the show should play. Mini Directors do not have a time clock and so the schedule is not displayed. In the Sequences Available for SD Card Show, you will find a list of all sequences that can be added from your computer or duplicated from the SD card. The list is first sorted by sequences available on the computer, and then by sequences already on the SD card. Within those sequences are sorted based on if they are Animation or Musical. You may think it is strange to include sequences already on the SD card in the available list. However, this allows you to duplicate any sequence already on the SD card - including ones where you may no longer have the source (.LMS or .LAS). If your sequences are not located in your Light-O-Rama data directory, you can press the 'Change Directory' button to move to another folder on your computer. Sequences are displayed with either [anim] or [music]. Anim are ANIMATION (.las) sequences. Music are of course MUSICAL (.lms) sequences. Animation sequences are sorted to the top, followed by Musical sequences. PC is a sequence located on your computer. SD is a sequence located on the SD card show. To remove a sequence from the show, select it on the right side and press the "X" button. 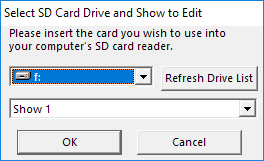 This removes the sequence from the SD card show, but does not delete the sequence from your computer. If you attempt to remove a sequence that can't be found, you will be warned. To change the order of sequences that are played in your show, select a sequence on the right and use the UP or DOWN arrow buttons. If you have a Deluxe Show Director, you can also optionally set a schedule for when this show should run. If the SD card was created with a schedule, the current schedule is displayed. •To change to a show that runs whenever the MP3 director has power (and the card is inserted), the button in the schedule section should say 'Schedule Ignored'. 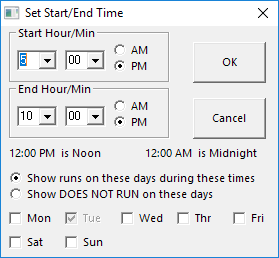 •To change to a show that runs on a schedule, the button should say 'Run the Show on this Schedule", and the days/times will be enabled. Select the start and end time you desire. If you would also like to quickly set other days to the same schedule, click the boxes at the bottom (the day you initially clicked is always selected and can not be un-selected). Once you are satisfied with the sequences to be created on the SD card as well as their order, press either Create SD Card - Simple Mode or Create SD Card - Advanced Mode. Simple mode will create an SD Card for 90% of situations. It will use a single port of your MP3 director at a default speed that should work with all controllers and sequences. All sequences from the existing SD card that were also found on the computer will be automatically updated on the SD card. Advanced mode allows you to customize how the SD card will be written. You should use advanced mode if your display contains pixels, DMX channels, or Intensity Files (Enhanced LOR protocol), or if you wish to select which sequences on the SD card are updated.